There’s no question that the CatGenie Self Washing Self Flushing Cat Box is one of the most advanced litter boxes on the market. It has a very high price point but some incredible features that may make it worth it to you. Let’s see what it’s all about. It really isn’t possible to get more convenient than this litter box. This cat box actually flushes the waste away and cleans itself. Considering that the worst thing about litter boxes is cleaning them, this is a huge advantage. 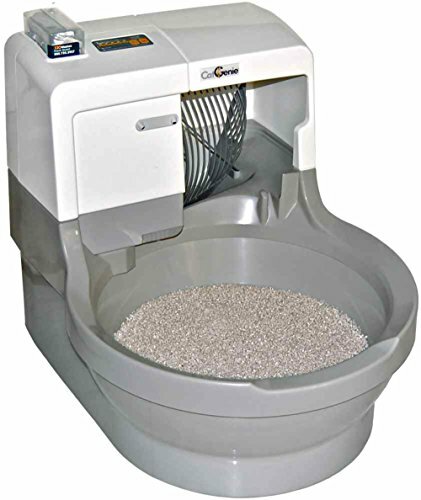 It’s also a great option for cat owners with mobility issues who simply can’t clean their litter box. petnovations-- Cat Genie - Misc. This litter box doesn’t use typical clay litter. Instead, it uses washable granules. They do a much better job of satisfying your cat’s need to dig and cover their waste. As a result, you don’t have the issue of litter flying everywhere and being tracked throughout your home. You can buy with confidence, thanks to the two-year warranty. This company is known for offering great customer service too. If you find that your cats won’t use it, you may be able to get a full refund. You also get lots of control with this option. You can set it on a timer to clean at certain times. For example, if your cats are active at night you could set it to clean every two hours at night but only every four hours during the day. This lets you save water while still ensuring your litter box stays clean. You can find plenty of litter boxes for ten bucks or less but this one will run you several hundred dollars. This is the biggest drawback, though of course some pet owners find that the extra cost is worth it. You should also keep in mind that you’ll have to buy additional washable granules in the future. This litter box can handle up to two cats of medium size but if you have larger cats, or more than three cats, then you’d have to buy more than one of these. Buying enough litter boxes for cats who need their own can get extremely expensive. You have to install this litter box. Most litter boxes you simply set down, fill with litter, and you’re done. This one actually requires a cold water hookup and uses an electrical outlet. This can make it very difficult to find a place to put it, and in many homes the only places that meet those requirements are out in the open. It’s expensive but possibly worth it for the convenience. For the cat owner with some disposable income, this could be a great buy. Just keep in mind that not only is the cost of purchase high but you must then continue to buy washable granules.